The nomination of Hillary Clinton by the Democratic Party in 2016 was among the worst blunders in the history of politics. She was the about the most status-quo candidate possible in an election where voters wanted change, representing everything which is most reprehensible in our political system. She was shown to have engaged in serious corruption in a year in which voters wanted reform, but many partisan Democrats continue to ignore the well-established evidence against her. It was clear Clinton would have difficulties with young voters, independent voters, many Obama voters, Sanders voters, swing state voters, and voters in rust belt states. (Yes, there is considerable overlap in these groups, and it should have especially been obvious that many of those who voted for Obama in 2008 or Sanders in 2016 were doing so because they did not want Hillary Clinton to become president). Beyond Clinton’s corruption and being wrong on virtually every major decision in her career, Clinton is terrible at running political campaigns. She is totally out of touch with the voters, and her political instincts are awful. She could not beat Obama in 2008, and could not have won the nomination in 2016 if the party insiders hadn’t cleared the field for her, in a system already rigged to favor a centrist over insurgent candidate, and then further intervened to support her when there was an unexpected challenge. The failure of the Democratic Party to pay attention to the desires of the voters resulted in the election of Donald Trump. Bernie Sanders had double digit leads over Trump while Trump and Clinton were close in head to head polling. If Bernie Sanders was the nominee, Democrats, not Republicans, would have won the voters who wanted change. Sanders could get the young, independent, swing state, and rust belt voters to turn out for him in far larger margins than Clinton could. Sanders would have addressed issues of concern to voters while Clinton ran a dreadful campaign which never gave voters a reason to vote for her beyond gender and the feeling that it was her turn. Sanders would have spoken to the press to get out his message, while Hillary Clinton avoided them as much as possible. With Sanders, there would have been no scandals, and no problems raised by being investigated by the FBI. Only partisan Democrats could think that she was exonerated after being exposed for conducting unethical and reckless behavior, and lying about it to the American people, because she was not indicted. Sen. Bernie Sanders of Vermont on Tuesday said he wished he had the chance to run against Donald Trump. In an interview on “Conan,” Sanders said that while he was unsure whether he would’ve defeated Trump, early hypothetical head-to-head matchups showed him far ahead. 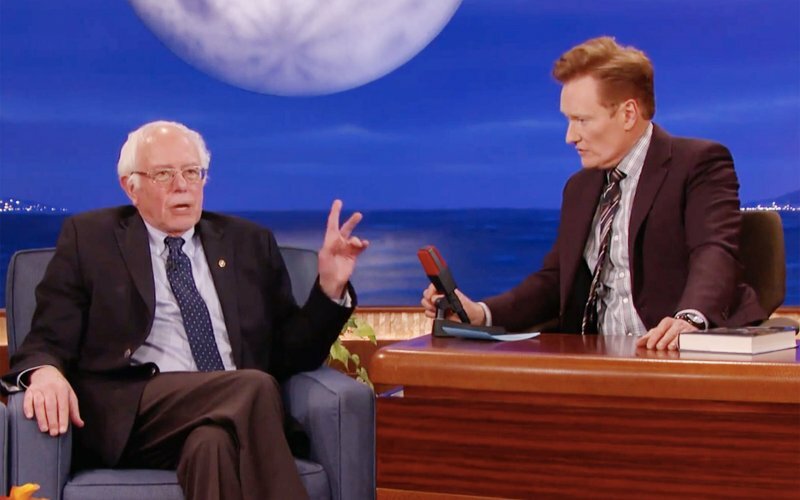 “What the polling showed that early on was all the polls nationally and statewide, I was beating him by much larger margins, much more than Secretary Clinton, but you know, then you go through a three-month campaign,” Sanders told host Conan O’Brien. “All I can tell you Conan: I wish to God I’d had the opportunity. I would’ve loved to have run against him,” he added. During his appearance Tuesday night, Sanders also ruminated on the nature of Trump’s election victory. He suggested that Trump used rhetoric to inflame racial and ethnic tensions but successfully branded himself as an outsider who could relate to many voters’ frustration with established industries. Pelosi easily beat Rep. Tim Ryan (D-Ohio), a seven-term lawmaker who launched an upstart bid to lead House Democrats two weeks ago in response to the party’s disappointing November election results and concerns that Democrats have become out of touch with working-class voters in key swing states such as Pennsylvania, Michigan and Ohio. But Pelosi’s margin of victory, 134 votes to 63 for Ryan, signaled a large degree of discontent with her leadership after 14 years atop the caucus and, more broadly, with the Democratic policy agenda that many lawmakers say has grown stale. While she cleared her self-declared margin of victory, a two-thirds majority, many Democrats were stunned that almost a third of the caucus was willing to vote for a backbench lawmaker with no major policy or political experience. Many were left wondering whether a more seasoned Democrat could have actually toppled Pelosi, with several privately suggesting these next two years would have to be Pelosi’s last as leader. Ryan’s 63 votes marked the largest bloc of opposition Pelosi has faced since winning a deputy leadership position 15 years ago that set her on a course to become the first female House speaker. Being “out of touch with working-class voters” is only part of the problem. Democrats are also out of touch with liberal voters, including many younger potential voters, on foreign policy, mass surveillance, civil liberties, and social/cultural issues. A Republican-lite party has little constituency beyond those content with voting for the lesser evil.